No Waste! A big part of our improvement efforts is to shine a big mirror upon ourselves and try to get rid of waste (big mirrors are always good, a little uncomfortable, but very, very necessary, no?!?). So to make our cycle time quicker and our quality and overall experience better for our customers, where can we minimize waste? 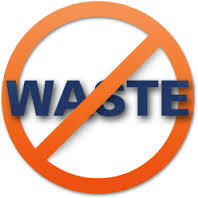 Despite pride in one’s business, with the proper eye, there is typically LOTS of waste that can be reduced. And sure enough, gnarly culprits such as wasted movement, wasted materials, movement of work and people and errors (rework and/or comebacks) were some pretty visible issues… Getting each of us to develop that discerning eye as individuals and a team is the other trick. Slowly but surely though, we began reducing some wastes and like any successful diet… it feels good! And like any diet, the trick is to MAINTAIN so it’s no longer a diet but rather a way of life.